well well well: Greece.... how much should we take? then their prime minister comes up with a referendum!!!!!!!!!!!! WTF? a referendum? first you accept money and then you go for a referendum? will you pay all the money back when the result is negative? so... should WE pay extra taxes to our governments to support this? Re: well well well: Greece.... how much should we take? They are in war. Since 1974, over Cyprus… This war is still ongoing even if there is a truce in place. As Tuzrkey is powering up, the Greeks feel they also need to equalize. US - also in war - spent 698,105,000,000 $ in 2010, as you say, "way ridiculous amounts... -snip- with money they don't have". Greece has spent 10,398,498,000 $ in 2010, that is about a 60th. US spending is around 4.7% of GDP, Greece 3.2 (data from SIPRI). None has the money, but we critizise Greece for the spending. Get real, plz. Perfectly understandable: They fear another coup, and with reason: 15 coups took place in the last 60 years, the 1974 being the most remembered. As the military threatened to coup again should austerity measures be taken according to the European plan, best and correct way is to cut all heads that might be involved in such undertaking. Nooooobody wants another inquisition! Greece is pulling Europes nose since long. In March 2004, while PASOK was still in government, Eurostat refused to validate the fiscal data transmitted by the Greek government and asked for a revision, as it had done previously - twice - in 2002, then resulting in a revision which changed the government balance from a surplus to a deficit. A worse blow came in May 2004, when the European Commission harshly accused Greece of "imprudent" and "sloppy" fiscal policies, pointing out that since Greek economic growth had been an annual 4% in 2000–2003, a declining fiscal position could only be the result of government mismanagement, including concerns by the EU regarding the 103% public debt to GDP ratio which Karamanlis inherited from the previous PASOK regime. With this report, the Commission effectively called into question the quality of Greek economic data, as the Eurostat had done in March. - a referendum has two purposes: A) To gaine time (no referendum until January = no paying for 3 month, same I did when I could not pay the rent: Gain time!) B) To clarify that for whatever goes wrong, the people and not the government is the culprit. Only weak governments resort to referendums, giving the people (king for one day) the opportunity to answer in a reduced black/white layout yes or no about soultions for a case the government SNAFUd. As strange as it sounds, such referendums are deeply anti democratic, making ridicule of the representative system. (As german Chancellor Andrea Merkel refused money if a referendum was held we had a nice cartoon this morning: First row, Merkel besides Sarkozy, besides Papandreu, Sarkozy commenting something into the ear of Merkel, pointing at Papandreu: "Well, if we decide to be so undemocratic to not accept a peoples decision in a referendum, why dont we just torture him a bit until he accepts the deal?" 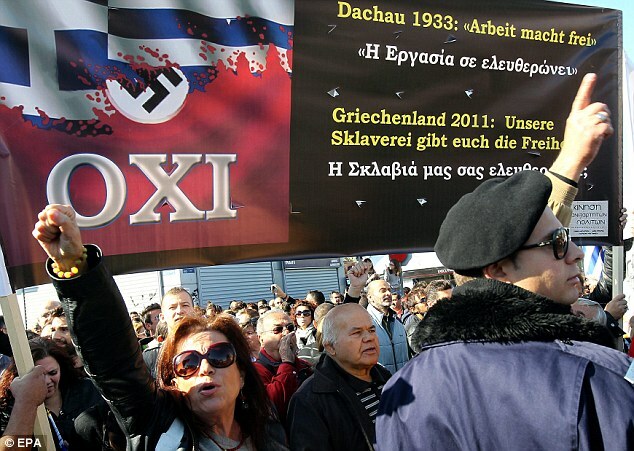 and the reactions from Greece towards Germany? Personally I think Greece needs to be booted for touch, they lied to get into the Euro club now they are dragging it down with them. I wonder.... why don't they refuse the European money? 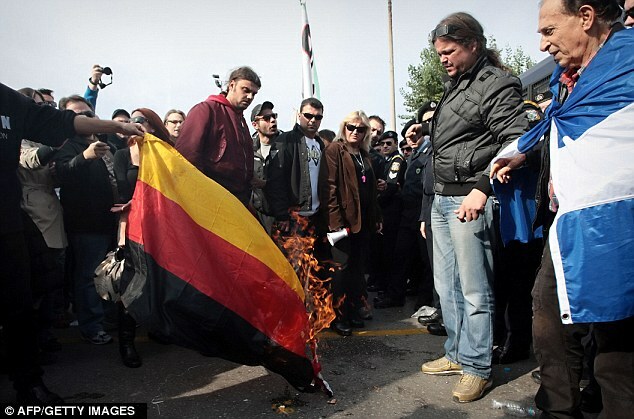 since they accuse Germany of neo-nazism they should refuse it, not? and probably decide to step out of the Euroclub? For the same reason politicians tell people they have to tighten their belts while every year they recieve bigger than average pay rises, they are hypocrites. Greece is smart to some degree they know that Europe doesnt want them to fail so they can waste money and as belligerant as they like but given the state of European finances it is only a matter of time before that situation changes and they are cut adrift. 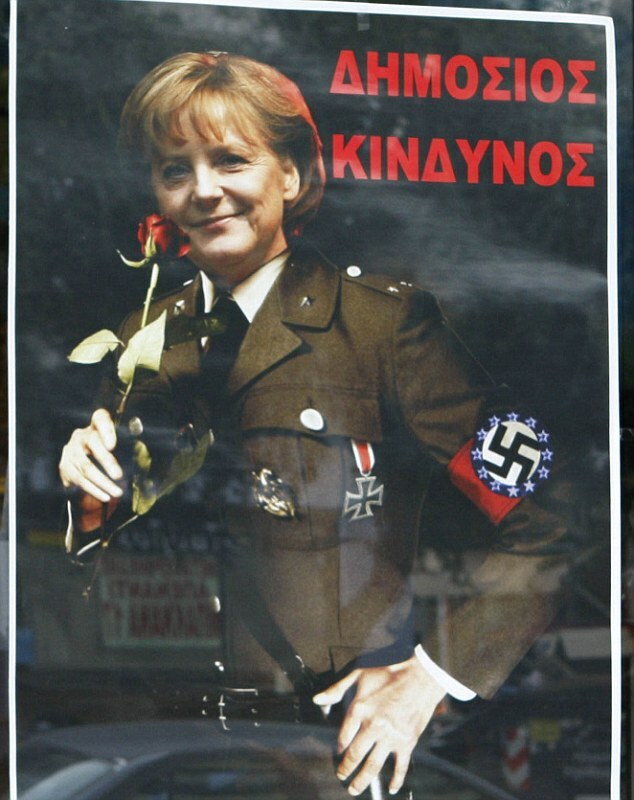 The German weekly magazine Focus has gone on trial in Athens over a satirical cover of Ancient Greek goddess Venus raising her middle finger to European leaders, symbolically presenting recession-hit Greece ignoring other member states. The Focus February 2010 cover, titled as “Cheaters in the Euro-Family” depicted the famous Venus de Milo statue, draped in a Greek flag, making the insulting gesture. According to AP, the German magazine’s publisher and another twelve journalists have been charged with defamation and insulting a national symbol. For most folks, no news is good news; for the press, good news is no-no news, and people everywhere confuse what they read in newspapers with true news. Greek Police Threaten IMF Arrests Due To "Austerity Demands"
As the headlines from Europe become more and more realistic (and ironically more and more Onion-worthy), Reuters notes one of the more interesting examples of just how the Greek people are feeling. The Federation of Greek Police have accused EU/IMF officials, in a formal letter, of "...blackmail, covertly abolishing or eroding democracy and national sovereignty". While violence erupts among the largely unemployed youth, the supposedly 'grown-up and responsible' segment of the Greek society, which for now at least appears not to be on strike, is recognizing the wholesale destruction of their society (as 22% cuts in minimum wage for instance are thrust upon them). The Greek police, who have stood against the protesters and done their jobs facing threats and anger, are seemingly expressing solidarity with the antagonists as they call out ECB, European Commission, and IMF leaders for their destructive policies. At what point do the police throw down their riot shields and follow the Greek people into their 'Bastille'? Feb 10 (Reuters) - Greece's largest police union has threatened to issue arrest warrants for officials from the country's European Union and International Monetary Fund lenders for demanding deeply unpopular austerity measures. In a letter obtained by Reuters on Friday, the Federation of Greek Police accused the officials of "...blackmail, covertly abolishing or eroding democracy and national sovereignty" and said one target of its warrants would be the IMF's top official for Greece, Poul Thomsen. The threat is largely symbolic since legal experts say a judge must first authorize such warrants, but it shows the depth of anger against foreign lenders who have demanded drastic wage and pension cuts in exchange for funds to keep Greece afloat. "Since you are continuing this destructive policy, we warn you that you cannot make us fight against our brothers. We refuse to stand against our parents, our brothers, our children or any citizen who protests and demands a change of policy," said the union, which represents more than two-thirds of Greek policemen. "We warn you that as legal representatives of Greek policemen, we will issue arrest warrants for a series of legal violations ... such as blackmail, covertly abolishing or eroding democracy and national sovereignty." The letter was also addressed to the European Central Bank's mission chief in Greece, Klaus Masuch, and the former European Commission chief inspector for Greece, Servaas Deroose. Policemen have borne the brunt of the anger of massed protesters who frequently march to parliament and clash with police in riot gear. Chants of "Cops, pigs, murderers!" are regularly hurled at policemen or scribbled on walls. Thousands turned out on Friday for the latest protest in Athens, this time against new austerity measures that include a 22 percent cut in the minimum wage. A police union official said the threat to 'refuse to stand against' fellow Greeks was a symbolic expression of solidarity and did not mean police would halt their efforts to stop protests getting out of hand. My take for why no ties are cut is that it is all about the five banks that more or less run the world economy and their fear to lose money (and they would if Greece cannot pay or even more they would lose should Greece skip out of the Euro and this currency go down the drain). The problem is not the debt as such (every government and state has to have a certain debt because of the long time returns on investments: You dont have to pay construction of a motorway in cash as it will be used by various generations hence various generations may pay it), but the arbitrary change of valuation of this debt through banks and rating agencies. The five main banks (Goldman Sachs, JP Morgan, Bank of America, Citi y HSBC) have through financial speculations in derivates accumulated a risk of 250 Billion Dollars (and that is European Billions, i.e. American Trillions, i.e. 250 Millions Millions Dollars, 250.000.000.000.000 in numbers; USA has a GdP of 15 Billions in this range). Imagine what would happen if only one of them should fail (and this number also makes it clear why this is not capitalism in its traditional sense at all anymore). A total of 249,337 billons of $, and the banks still make huge profits. I understand exactly why the normal working man or the middle class does not understand why they should pay for this mess the 5 biggies produced. Same thing as in Greece will happen in Portugal, Italy, Spain, Belgium, Holland and maybe even US, Germany and France. I am strictly against violence in this respect, as it is stupid: If just everybody would reverse the charge and make the banks eat their own medicine (being out of liquidity) by simply withdrawing all his unds from the banks the system would crash easily within a week and we all could start anew. What happens now is that the 5 banks (and GoldmanSachs leads) want to take over the nations as assetts to guarantee they cannot lose in this game (they implemented the ex G&S bankers Monti in Italy and Papadimos in Greece), and this is deeply antidemocratic. I hope that when the moment comes in Spain we will not see street violence but everybody taking the cash out of the system. The worry is if Greece defaults it starts a domino effect. That soon after that Italy and Spain would also default. This may be true but at some point you have to stop throwing good money after bad. I have no doubt that it would lead to a collapse but nothing we are doing at the moment is doing anything more than delay the inevitable. I'm not sure I don't agree with that. The question of the thread was why are they still throwing more money at Greece. I was just answering why they continue to do so. why aren't they reacting to previous governments and politicians because THEY are the ones to blame! and ofcourse the numerous CEOs and other moneywolfs!!!!!!! What we are getting is that the Greek people are not wanting to make any changes to the way they live their lives or run their country. Hmmm.....wonder how that will work and make all that debt just go away...they need to let the rest of the world know how to spend yourself into a hole then just snap your fingers and make it all go away. 4000+ people in Greece owe the state 15 milliard euros tax money, which makes you wonder how much money all Greeks together have to pay for tax . I think its the same amount they receive from the European governments. 1000's of people steal money from the state by rcashing social security money from dead people. What is it with Europe, why can't you guys seemingly make a decision? Seriously it seems like you need a national debate and a 2 year environmental impact report before you can get a haircut these days. Greece is determined to fail, its people seem to want to fail so let them.